Metal scrap is one of the largest type of waste generated in Singapore. In 2013, about 1.41 million tonnes of ferrous metal scrap and 135,100 tonnes of non-ferrous metal scrap was generated. The recycling rate is 97% for ferrous metal and 84% for non-ferrous metal in 2013. Ferrous metal scrap is usually sent to a local steel mill for recycling or exported. Non-ferrous metal scrap is usually sorted and exported overseas for recycling. Metals are divided into two types: ferrous metal (iron and steel) that are magnetic, and non-ferrous metal (stainless steel, aluminium, copper, brass, bronze, nickel, and other metals) that are non-magnetic. Recycling aluminium requires only 5% of the energy and produces only 5% of the CO2 emissions as compared with primary production and reduces the waste going to landfill. Aluminium can be recycled indefinitely, as reprocessing does not damage its structure. Aluminium is also the most cost-effective material to recycle. Recycling one tonne of steel cans saves 1.5 tonnes of iron ore, 0.5 tonnes of coal & 40% water usage. Recycling 1 tonne of steel scrap saves 80% of the CO2 emissions produced when making steel from iron ore.
At the metal recycling plant, sorted metal scrap goes into a furnace at high temperature. The molten metal is poured into casts to produce ingots or rolled into sheets of metal. Metal scrap can be 100% recycled into metal bars, sheets and ingots for making new metal products such as drink cans, metal construction materials, and car parts. In Singapore, about 1.41 million tonnes of ferrous metal scrap was generated and the recycling rate is 97% in 2013. For non-ferrous metal scrap, 135,100 tonnes was generated and the recycling rate is 84% in 2013. All types and sizes of metal scrap are collected by waste metal collectors and traders. 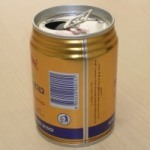 Drink cans and metal containers are usually collected through the recycling programmes. The metal scrap are sorted by type manually or by using magnets. The sorted metals are then cut, sheared, shredded, baled or briquetted for storage and transportation. Steel scrap is usually sent to a local steel mill for recycling or exported. Non-ferrous metal is usually exported overseas for recycling. To find a recycling collector or someone who wants your metal waste, check out NEA’s list of collectors and traders. You can recycle metal scrap and metal cans through the various recycling programmes at home, in school and your office, or through the public recycling bins. But before you do so, remember to Reduce and Reuse your metal waste. I would like to know, whether the Eclipse Mints’ metal box can be recycled or not? Hi, are those steel boxes? You can check with the recycling company serving your area. When I was overseas, I used to keep those soft drink metal cans. When I had a bag full, I brought them to this supermarket where there is a machine for me to slot the metal cans one by one. The machine press the cans and a voucher where I could get discount from the supermarket (amount depend on the number of cans I slotted into the machine). May I know if we have such a machine in Singapore? I’m not particular whether I get discount or not, more important where I can properly dispose the metal cans. I know there was such or similar machine in AMK Hub fairprice, but It was gone. If you have any info on this, kindly let me know. Hi Janice, the reverse vending machines used to be placed at FairPrice Ang Mo Kio, Marine Parade and City Square Mall. Not sure whether the machines are still at the 2 other locations besides AMK. You can always use the public recycling bins at MRT stations or those near housing estates (see the map for locations – http://www.zerowastesg.com/our-initiatives/map-of-recycling-bins/). Or if you are under the National Recycling Programme, you can make use of the recycling bags or bins for the cans. Thanks very much, Eugene for the reply. I’ll try and see at City Square. I didn’t want to put them into those recycle bins because I saw some people ransacked the bins for cans and newspapers for their own benefits. Sometimes, they quarrelled with each other as to who got there first. haiz…. I am interested to know the location of the companies in Singapore recycling metals instead of the processes. How to recycle aerosol spray cans from industrial factory? Drain fluid and collector will accept to recycle? I’m doing a project about metal recycle. I would like to know the percentage of the metal in rubbish. But I can’t find the report of the rubbish in singapore. Can you help? Please and thank you. I am currently doing a project and I would like to check how much recycling companies will be willing to pay for drink cans. Also, currently in 2014, how many reverse vending machines are there? I appreciate your help. Thank you! I’m looking for supplier of steel plates suitable for making metal cabinets and computer racks. I would need steel quality with minimum 50% of recycled steel. Would you be able to recommend me any such steel suppliers for my consideration? Thanks! I’m looking for aluminium foil scrap to be exported. Please contact me at vandyw95@gmail.com if you are interested. We have the pleasure to introduce ourselves as one of the leading scrap trading company M/S: AL-SOLB MODERN LLC.CO, based in Oman. We are maintaining our leading position in the Oman market. We are selling mix surplus material as scrap at very low price. We are looking for the genuine buyers in the industry who is looking for reliable and trustworthy scrap suppliers, so we have collected contact info of some reliable buyers that we can trust. Kindly only serious and interested scrap buyers feel free and get back to us for further details, following is the list of the inventory of the Surplus material that is ready for shipping. All above are based on the documents and exact tonnages will be specified at the delivery time. Where to sell recyclable item ?? Hi – why isn’t aluminium recycled in Singapore? Doesn’t shipping it overseas to be recycled create additional carbon footprints? i want to know that where i can found hospital and medical equipments scarps yard? i want to purchase hospital equipments ifyou can give me the positve suggestions that i can b able to found it and want to buy a stuff. I’m wondering where are the places I could pick up some used metal pipes for free? It is for an upcycling project I’m doing right now. Mr Eugene Tay, may I ask what happened to the Cash for Trash Initiative? it use to operate every Saturdays under some HDB flats. there was so much publicity when it started then it just died down. it was a very good initiative. I used to see old uncles & aunties carting boxes to sell for a bit of money.